I really enjoy the shows at Broadway by the Bay - so much so that I ushered there for a few years. 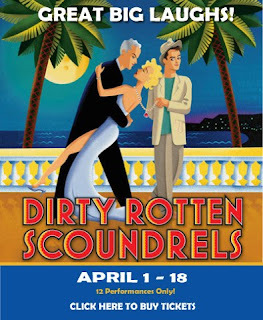 The new show is Dirty Rotten Scoundrels. Here's a description: "Let the fun begin as we travel to the French Riviera with the riotously funny, Tony-nominated musical comedy, Dirty Rotten Scoundrels. Based on the popular film, this is the story of two very funny con men who try to out-con each other. The battle between them will take you on a hilarious adventure filled with twists, turns and great big laughs!" The movie version featured Steve Martin and Michael Caine. Frisco Kids readers can get $10 off when ordering tickets. Use the code word "FREDDY" and tell them Alyson sent you. Or go to the family matinee on Saturday April 10th at 2 pm and tickets are just $15/adults, $5/kids.